This box is part of a more comprehensive article to test different "economizers" of fuel placed on the market. 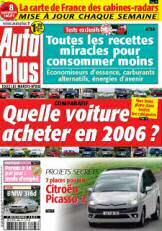 If you want to read the full article, so you need to consult the archives to find autoplus.fr there the number 895. For this, click here. Our review of this item is as follows: "It is quite remarkable that only the water doping has a good result in consumption, the other economizers being simply" phony "but the test has noticed a slowdown in pollution (probably due to the excess water injected and the non optimization of the assembly) "
The conclusion is a bit hasty: "water engine ... it pollutes ..."
In any case the tests were done on an "amateur" construction ... imagine the results on a "real" proto made by the builders .... ? Moreover we do not know the test protocol followed for the clean ... if it was done in slow motion (maximum suction in the bubbler and minimum temperature in the reactor) it is not surprising that such results inject ... large amount of water in an engine will not favor the combustion..Bien the contrary. As said econology, the engine of the car has aged and it probably would reject unburned (how?) Without Pantone. In addition the test pollution is actually static and probably at idle, which does not promote performance pantone .. It is still super satisfying to see an amateur installation tested by auto-plus with a good result. For unburned, surprising. Among the non-engine optimization, and the rest was to be expected. Learn more and join the debate. To participate in the discussion about this article (or discuss what has already been said) click here.